Rain continues in the District and many roads are impassible! While in some areas the rain has diminished, the threat continues. Please stay off the roads until this storm passes and waters drain off the surface streets and feeders. We and other agencies are continuing to run water rescue calls at this time. Please do not put yourself in danger...stay out of moving water. 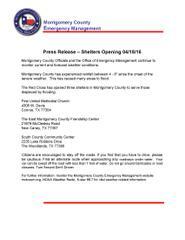 Attached is a press release from Montgomery County Emergency Management advising shelter locations if you need shelter during this storm.